A cabin cruiser usually ranges in size from 7.6 to 13.7 m (25 to 45 ft) in length, with larger pleasure craft usually considered yachts. Many cabin cruisers can be recovered and towed with a trailer and thus easily stored on land, which reduces maintenance and expense. These craft are generally equipped with a head (toilet), a galley, and at least one berth. Most cabin cruisers usually have a small dining area and some have an aft cabin (a cabin to the rear of the cockpit, with a double bed). Some cabin cruisers are equipped with heating, air conditioning, and power generators. Most also have water heaters and shore power electric systems. 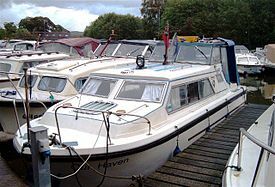 In the UK, purpose-built cabin cruisers were popular on the canal network in the 1960s and 1970s. Leading manufacturers were Norman, Viking, Microplus, Freeman, and Dawncraft. Today, they are more commonly found on the navigable rivers rather than canals. ^ "The Dictionary of English Nautical Language Database" Seatalk.info. Accessed August 2011.